The next upcoming Isra and Mi'raj is on sundown of April 2 ending at sundown on Wednesday April 3rd, 2019. According to the Islamic calendar Isra and Mi'raj falls on the 27th day the seventh month of Rajab. 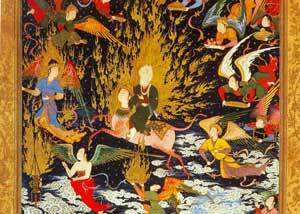 For Muslims this day relates to Prophet Mohammad's trip from Mecca to Jerusalem and his ascension into heaven. Many will attend prayer service at mosques or in private settings. The day emphasizes the importance of prayer and reviews the relative importance of the trip Prophet Mohammad made from Mecca to Jerusalem and his ascension into heaven. During the 10th year of Mohammad's prophecy the angel Gabriel woke him and traveled with him to Jerusalem where he prayed at the Temple of Solomon with the prophets including Jesus, Abraham and Moses. Then from the rock of the temple mount (where the Dome of the Rock Sanctuary) the Angel Gabriel carried Mohammad to heaven where Allah told Mohammed about five daily prayers that all Muslims must perform.